My latest addition to the five new sculptures I intend to include in the upcoming show Krasl Art Fair on the Bluff next month in St. Joseph, MI. “Resisting Destiny” represents inevitability. The insurmountable,irrefutable fact that we cannot control or run from what is our destiny.. It is always there all around you ready to engulf you as a tidal wave does, to sweep you off your feet, taking control of what you only thought you had control over just a second ago. 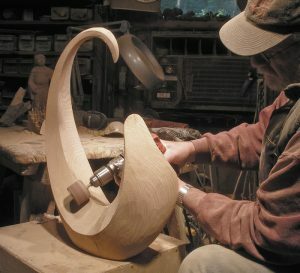 For this sculpture I am using a piece of red oak shaping it to provide two distinct elements in a reflection way about to interact. In developing the design for my concept I work to incorporate the two elements in a way that they appear as perpetually linked, as if one. This continuity is important if the image is to successfully convey the feeling of the elements spilling back on themselves in a tumbling fashion like a wave on the beach. A sort of ordered chaos..